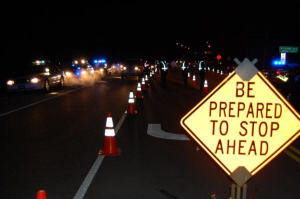 DUI check points are a very controversial, yet often effective method that most states use to combat drunk driving. Particularly on busy holiday weekends. It has unsuccessfully been argued that they violate the 4th amendment. As a reminder, the 4th amendment guarantees protection against unreasonable searches and seizures. However, as long as these check points are announced in some way ahead of time, they are considered perfectly legal. This warning can come in many forms, but most often it is a sign in the road alerting drivers just prior to entering the stop zone. Last week Michael Picard, a resident of Connecticut who believes these check points are illegal and unnecessary, decided to take matters into his own hands. Picard positioned himself on the grass next to the highway on-ramp with a sign warning drivers, well in advance of the check point. Normally by the time you see the warning sign it’s far too late to turn around. Any attempt to do so is generally seen as a red flag to law enforcement officials who are watching for drivers attempting to evade their grasp. By virtue of his positioning, it’s likely that many drivers escaped lengthy delays in their commute, and in some cases, outright prosecution. Naturally this made law enforcement officials very unhappy, and they quickly confronted Picard. Initially they told him that some passing motorists had complained of seeing him waving around a drawn pistol. Although this was false, the fact that he was a hand gun owner with an open carry permit which he was wearing at the time made the story plausible. Being a seasoned protester, Picard was prepared with his camera phone and recorded the interaction. This also did not sit well with the troopers. They confiscated his telephone and handgun and left him seated on the grass while they decided his fate. A trooper placed Picard’s phone on the roof of his vehicle and proceeded to discuss which charges they could fabricate against him and how they would justify them. Fortunately for Picard, his phone continued to record and captured audio of the entire conversation. At one point, one of the troopers can be heard saying, “You want me to punch a number on this either way?” Which is the law enforcement term for entering a criminal charge. The ACLU has now taken up the cause and is currently suing the state for an undisclosed amount. Remember. Law enforcement is NOT on your side. Michael Picard was very lucky to have his incident caught on tape. Otherwise, it’s very likely that he would have no recourse in a clear case of corrupt conduct. They will do anything they can inside and outside a court of law to make sure you suffer the harshest consequences they are allowed to administer. Whether you deserve it or not. Don’t let your rights get trampled on by overzealous and unscrupulous prosecutors and law enforcement officials. Get yourself a FORMER PROSECUTOR now!